If you are looking for Italian language schools in Tuscany, then why not venture further afield than Florence, Siena or Pisa into undiscovered undiscovered and wild Tuscany, full of Etruscan treasures, medieval cities and hill towns and some of the most beautiful beaches in Italy. Where the tranquility and pace of life will slow you down and the wonderful home-cooked Tuscan food and local wines leave you wanting more. I can think of no better place to have an Italian language lesson. And you can even combine learning this wonderfully expressive language with cooking lessons, archaeology and art excursions, snorkeling, surfing, wine tasting and more. Relaxed and having fun is the perfect way to learn. 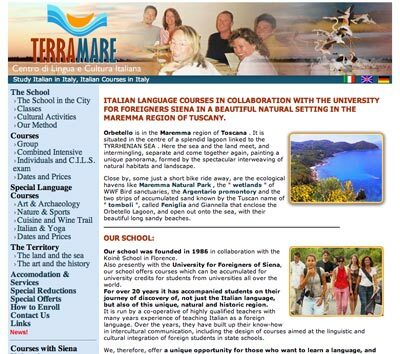 The Terramare School of Italian Language is based in the old Etruscan city of Orbetello along the Costa d'Argento (Maremma's Silver Coast) with its beautiful coastal lagoon, World Wildlife and international bird and nature reserves, the Maremma National Park, and stunning Monte Argentario and the Tuscan archipelago islands of Giglio and Giannutri close by. A very special place indeed. Open all year, they offer a wide range of Italian language courses in collaboration with the Siena University for Foreign Students (Università per Stranieri di Siena). Transferable university credits may be obtained upon completion and passing of an examination at the end of each course. Class sizes are always small: between two and six people. Assistance is readily available if you need it (free of charge) to help you find your desired accommodation. 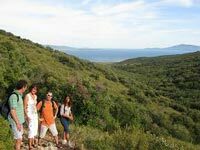 A group course of 20 hours per week with cultural excursions and activities included. Language tuition in the mornings with activities and excursions in the afternoons to artistic and archaeological sites, monuments, and historical centres. Combine Italian language studies with your favourite sports "in one of the most exquisite natural environments in Italy". Choose from canoing, rowing, and sailing in the lagoon, surfing, sailing, scuba diving (beginners and professional), snorkeling, horseback riding, trekking, and cycling. A two week course of general Italian language lessons, with expert cook tuition within traditional Italian family kitchens. 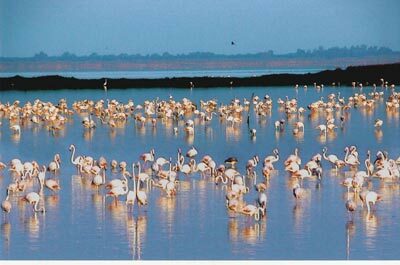 Plus culinary excursions such as the fish farm on the Laguna di Orbetello, Tuscan wine tasting, a cheese-making centre in Maremma, and some lunch and dinners in local restaurants. I think I'll book myself on this one! Sounds great. A two week course comprising of a seven day yoga course at the Ebbio yoga retreat - a converted 14th century Tuscan farmhouse - with a five day Italian language course at the school.